What will people in the future think about architecture since 1900 in the Alps ? 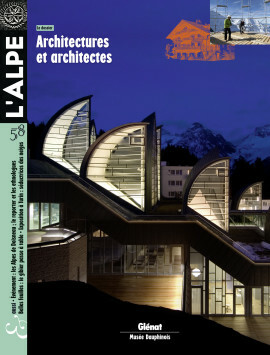 The architecture of Alpine homes, for ages based on local, so-called traditional concepts showing great diversity in the use of a small number of constants, has long been a topic of interest. Then, with tourism came modern architecture and contemporary creations. For better and worse. Marguerite Burnat-Provins (1872-1953), a painter, writer and thinker, lived several years in the Alps. She defended radical positions, notably concerning the place of architecture in mountain landscapes. On 17 March 1905, she published this controversial article in the Gazette de Lausanne. An essential text that led to the founding of the League to preserve picturesque Switzerland. Tradition or modernity ? That is the question now confronting architects, towns and inhabitants. 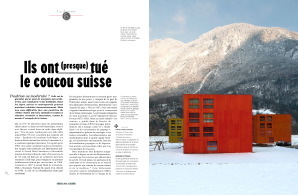 In the Alps, older and contemporary architectures can live harmoniously side by side, though with some difficulties given current imitations of the famous « chalet ». A number of initiatives attempt to stimulate creativity and innovation, for example in Switzerland. Born in the heart of the Alps, the famous architect has recreated around the world the stony features of the mountains. Museums, cathedrals, cultural centres, etc. compose a monumental life work that is immediately recognisable and widely acknowledged. Marc Givry has had the pleasure of working for years with the outstanding creator and presents an intimate portrait here. It was in the blue and green shades of quartzite at the Vals spa that Dominique Issermann photographed actress Laetitia Casta. Exceptional women in an equally exceptional architecture, designed by Peter Zumthor in the heart of the Grison mountains (Switzerland). Can the new mountain refuges be considered model architectural designs for a world that must moderate its energy consumption ? Confronted with the difficulties of an exceptional terrain, new solutions have been found. The choice in favour of modernity is slowly converting people who often prefer a traditional chalet-type refuge. Is the future of Alpine architecture now being invented on the upper slopes ? The most beautiful village in France ? The village of Castillon, in the Alpes-Maritimes department, has been rebuilt twice in less than a century. The last time, just after the war, modern architecture supposedly based on Provençal traditions was imposed, unfortunately a few essential cultural aspects of the mountainous region were forgotten. We invite you here to discover other types of architecture, both mineral and artistic, on an off-beat hike through the Haute-Provence geological reserve to see some contemporary art. The young guy from the Parisian suburbs travelled to Saint-Véran in the Queyras mountains in 1947 for Regards, a weekly with close contacts to the Communist party and that published his account one year later. Doisneau was neither the first nor the last to visit the village that, over the past century, has become a well known study site for ethnologists from around the world. This little known facet in the work of the great humanist photographer may be seen, among other facets, at the Ancien Évêché Museum in Grenoble as well as in an exhibition catalogue to be published by Éditions Glénat. No need to be a cordon bleu or a Nemrod to prepare a delicious meal of game brought in from the hunt. That is precisely the point of a nice little book published by Glénat with a succulent collection of recipes. Here is a sample to start the hunting season off on the right foot. Whether elegant or mischievous, they charm their way on the snowy slopes and… on the magazine covers. For decades, mountain women have fired the imagination of illustrators. A delightful stroll through contemporary images and art at the Mountain Museum in Torino.